Turtle Chip, Very Berry, White Macadamia, Regular Chocolate Chip, Salted Caramel, Chocolate Chip Pecan. When is there ever a time when you're not in the mood for a bangin' cookie? Never. 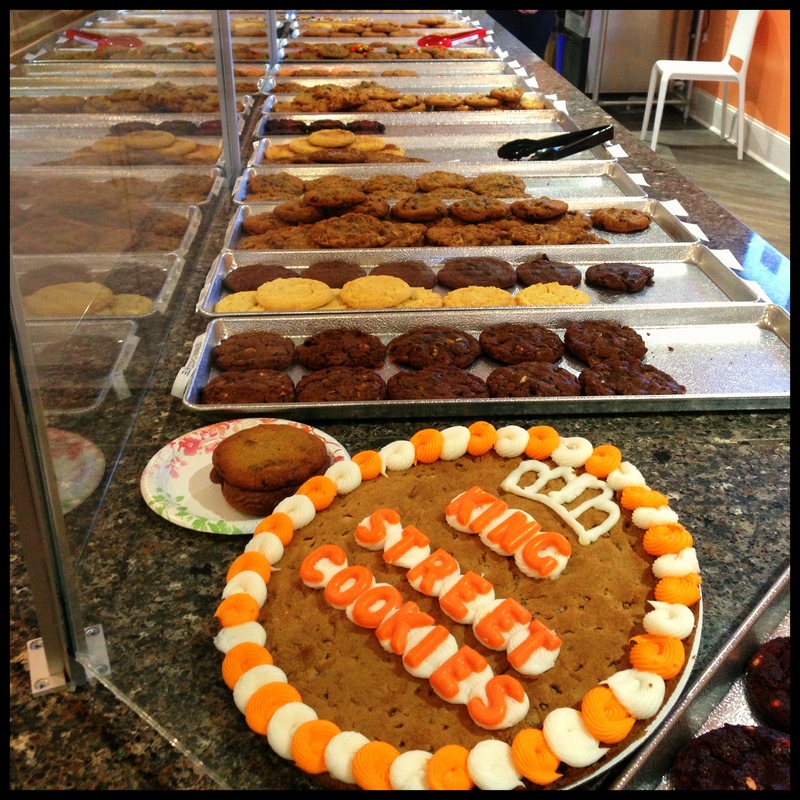 The best cookie place is hands down King Street Cookies in downtown Charleston, South Carolina. There are always at least 20 different kinds of cookies to choose from. There is also a milk station because milk and cookies are the best combinations! Even better, there are two huge orange chairs in the front of the cookie shop, so you can feel like a king or queen while indulging in a great cookie. The atmosphere of the King Street Cookies is so welcoming. They have a mascot named "Mochi" who from time to time stops in. Mochi is the cutest dog you will ever meet. They also have an event for his birthday! Anyone who walks into the cookie shop on his birthday and tells him "Happy Birthday" gets a free shirt or sometimes a cookie. A very smart marketing tool, King Street Cookies. "Ok, so what types of cookies does this place even have?" Oatmeal Raisin, Chocolate Chip M&M, Peanut Butter, MexiCoCo Spice, Peanut Butter Chocolate Chip, Ginger Snap, Apple Delight, Red Velvet, GW's Cherry Tree, Sugar, German Chocolate, Toffee Crunch, House Specialty, Turtle Chip, Very Berry, White Macadamia, Regular Chocolate Chip, Salted Caramel, Chocolate Chip Pecan, Strawberry Fields Forever, Chocolate Chunk, Snickerdoodle, Choco Choco Chunk, Sugar M&M, Fudge Pecan, Peachy Keen, Lemon, Praline Pecan, and many more! This cookie shop isn't all about the cookies either, They have ice cream and coffee as well. Whenever you're in the mood to treat your sweet tooth, I 10/10 recommend going to King Street Cookies (you won't regret it).